Fyodor Soloview, head of InterBering, LLC, favorably comments on Russian plan "United Eurasia" to build a railway line directly connecting Russia and USA via Bering Strait tunnel, responding to the articles posted in The Moscow Times and The Siberian Times on August 12th. 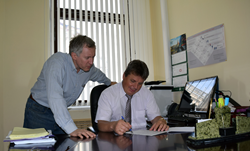 President of InterBering LLC Fyodor Soloview (left) and Deputy Head of Technical Policy of JSCo Russian Railways Victor Alferov discussing construction of railroad in Russia toward the Bering Strait. "Private investors will be needed to complete the project", said Russian Presidential Aide and former Transport Minister, Igor Levitin. "Foreign companies would also be invited to participate." Soloview has made several trips to Russia to meet with Russian officials, including those in charge of railway planning ( http://www.interbering.com/Russian-Railways-support-letter.html .) Over the summer he got news that they are considering not only his plan for a Bering Strait tunnel, submitted to the Office of the Russian President on August 1, 2014, but also air trading links and new sea routes taking advantage of the receding polar ice cap. “The scheme offers integrated shipping and aviation 'hubs' to create conditions 'for the country to move to a new social and economic level through the deep exploration of Siberia, the Far East and the Arctic', according to a letter on the plan presented to Deputy Prime Minister Arkady Dvorkovich,” The Siberian Times published on August 12th, 2016 at http://siberiantimes.com/other/others/news/n0707-futuristic-airship-scheme-plan-unveiled-to-transform-siberia-and-the-arctic/ . The key would be for the U.S. and Russian governments to invest in rail lines, roadways and other infrastructure which would support the proposed Bering Strait railway tunnel, he adds. “Currently, Russian trade with Europe is many times greater than her trade with the United States. Existing road and rail links with Western Europe are a huge reason for this. A direct rail link across the Bering Strait would be an equalizer,” says Soloview. “Guess what Trump will be talking with Putin if not about construction of US-Russia railroad over the Bering Strait?” - questioned Fyodor Soloview. “The United States would have much to gain by taking the lead in this important project, perhaps even helping construct facilities on the Asian side. InterBering looks forward to bringing together government and business resources needed to make it happen,” he says. To take advantage of the upcoming opportunity, InterBering, LLC is currently seeking member-investors and funding to begin preliminary construction work on the North American side of the Strait. For more information visit http://www.interbering.com. Map of proposed railroad from Fairbanks (Alaska) to Yakutsk (Russia) via tunnel under the Bering Strait. 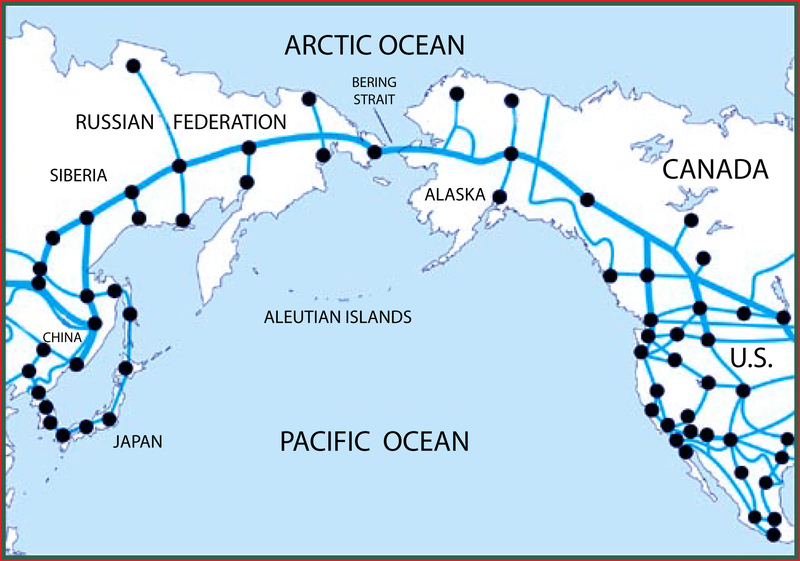 Map of Bering Strait and proposed network of conventional and high speed railroads in USA, Canada and Russia. 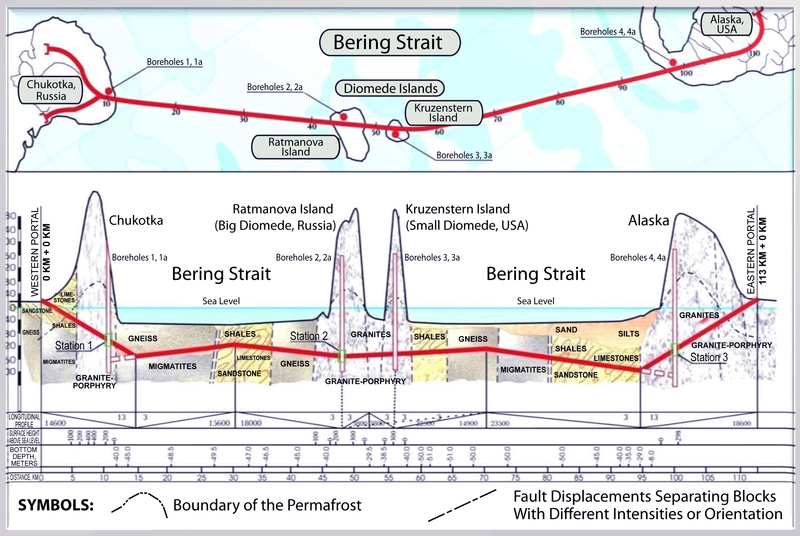 Bering Strait Tunnel cross-section between Alaska (USA) and Chukotka (Russia). 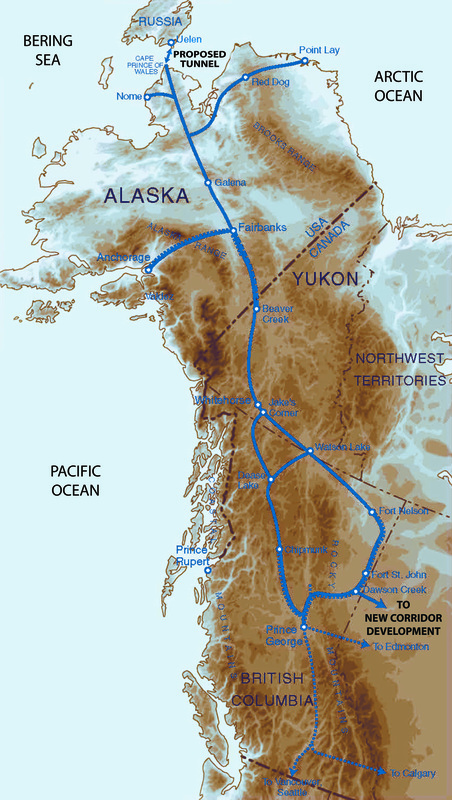 Proposed railroad lines in Canada and Alaska toward Bering Strait tunnel. 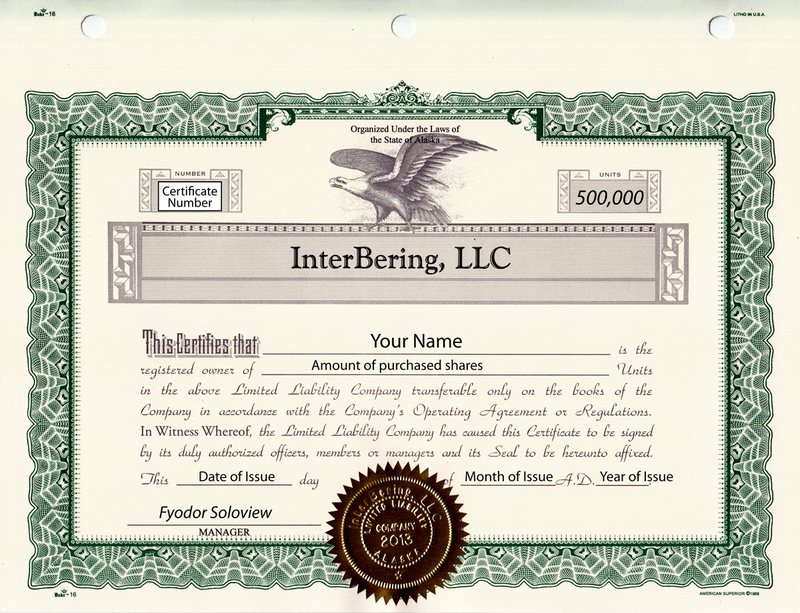 InterBering, LLC Member Certificate InterBering, LLC logo.